Science Hack Day Vilnius 2018 — some news! 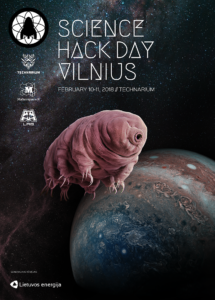 This year’s Science Hack Day Vilnius will be even larger and more exciting! We’re extremely grateful to our general sponsor Lietuvos Energija – their support is allowing us to plan a truly amazing event. We’re hyper-excited to invite some awesome mentors to Science Hack Day Vilnius 2018 (details to be announced very soon! ), who’ll help you with your projects and (hopefully) inspire everyone about open source and open science! This year we’ll also have a separate Young Scientist track for kids – there’ll be dedicated mentors, tools and a separate prize for the best Young Scientist team! Please register and get in touch with us (shdvilnius@gmail.com) ASAP if you’d like to take part – thanks to our sponsors, we’ve got accommodation available for kids and teachers from outside Vilnius. Thanks to Laserpas , this year we also have a special Space Hack prize – it’s an award for the best space, aeronautics and remote sensing-related project. We’ll let you know more about the prize and current challenges in space engineering in a few days! In addition, M-LAB, in collaboration with dr. Sergejus Orlovas (http://www.trismegistos.lt/) are preparing a separate photonics challenge and prize. The participants will be asked to work on light-bending devices and their applications. The event will be held mostly in English. However, that is not a requirement – you’re welcome to present in Lithuanian, and we’ll try to provide real-time translation for demos and talks. Please register as soon as possible, and keep an eye on this space for more exciting news!